Last year I went to the newest museum in Austin, the Blanton, which is part of the University of Texas at Austin. Though most of the works have been part of the university’s collection for many years, they were all new to me. One painting on the second floor caught my attention, and as I got closer I realized I had fallen in love! It was a work by Hans Hofmann, Elysium (I can’t locate a picture of it online). What struck me from across the room was the depth of color. It looked amazingly thick and rich. Once I got closer I realized it looked thick because it was! My second reaction was just pure awe at the beauty of the vibrant color choices. The whole piece sang with purity. A good example is this piece, “Pompeii” 1959 , which is done in the same style. I had to know more about Hans Hofmann, so I ordered a book as soon as I got home. I also spent time researching what I could on the internet. Hofmann (1880-1966), was born in Germany, studied art in Munich, and between the years of 1904 and 1914, lived in Paris. 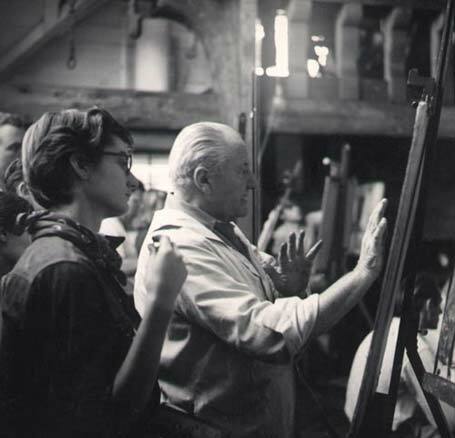 In Paris he was friendly with such revolutionaries as Picasso, Matisse and Bracque. In Paris Hofmann also struck up a friendship with Robert Delaunay. A second summer school was opened in Provincetown, MA, in 1934. In 1939 Hofmann’s wife Miz moved to New York City, and Hofmann spent the next several decades devoted to teaching the up and coming young artists in New York. He retired from teaching in 1958. The list of students who attended Hofmann’s prestigious school during these years is impressive: Lee Krasner, Helen Frankenthaler, Wolf Kahn, Joan Mitchell, Robert Richenburg, Larry Rivers, and the list goes on. He was incredibly influential on the Abstract Expressionists, and it was in a review of one of Hofmann’s exhibitions in 1946 that the term was first used. Something I found fascinating about Hofmann as a teacher is that he didn’t show his students his own work. He didn’t want to influence their work, instead encouraging them to visit museums and galleries. During these years Hofmann’s style flowed and grew more abstract. Portraits, still life, landscapes eventually moved into the Surreal and into some of the first drip and splatter style paintings. He had a philosophy about a painter having a whole different style for every mood, something which pulls together all of disparate works I found in doing my research (perhaps a better trained eye would see that they are from the same artist). It’s also an idea that makes me feel better about my own work, and definite lack of “style”! 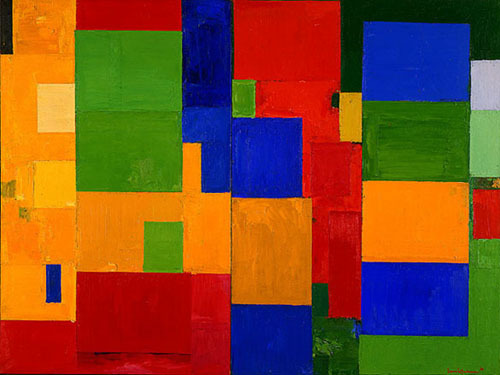 Besides his teaching, Hofmann is best known for his theory “push and pull”, which is the color theory of warm and cool colors pushing and pulling to create a sense of depth, movement and space. See a demonstration of it here. My favorite works of Hofmann are those that he did after his retirement from teaching. His use of the rectangle as “primary spatial organizer” is something I find fascinating. I think that it’s the rectangle used to demonstrate his push pull theory that thrills me. Most of us know about cool colors receding etc…, but this really does take that idea to another level and with it, Hoffman has created a very exciting world to step into. And the texture he created with the gobs of paint…well, as a fabric/texture-aholic, it’s just wonderful icing! I feel very connected to how you began, because in 1973 I visited Berkeley for my grandfather’s funeral, and a day later, still in a fog, I wandered into the then brand new UC Berkeley Art Museum, where the top gallery turned out to be full of Hofmann paintings he had left to the museum. I immediately fell in love with these wonderful works. . My understanding is that he had arranged that his works would be permanently on exhibit, but somehow or other the museum has failed to honor that, and today very few of his works , and none of the best, are visible anywhere in it. can you recommend a book in which Hoffman explains his color theory and also the push pull theory. I would prefer the artist own words as opposed to an interpretation by someone else. did Hoffman leave any teaching instruction type books or videos? 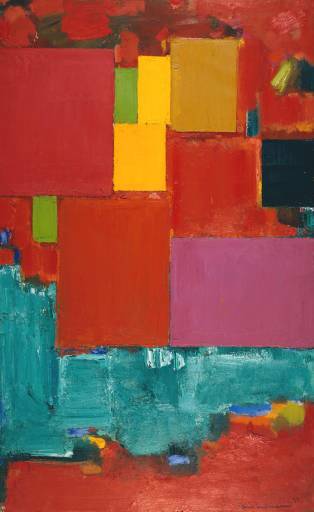 Color Creates Light: Studies with Hans Hofmann is the book you’re looking for, Nina. Hofmann’s teaching in his own words, and in the words of the artists who studied with him. The book will be released March 21, 2011. Available on Amazon, at the above website, and distributors TBA. The book, based on an oral history of Hofmann students, represents over thirty years of research and revision. I have no idea. I couldn’t find an image on the web either. I’d love to get a poster of that one, too! Do you know where I can obtain aa poster of Hans Hofmann’s Elysium? I also saw it in the Blanton Museum in Austin, but their gift shop is not completed and has no posters. I would really like to have one? Thanks for this post! I’ve requested a couple of books from the library and I will check out the links you have provided. I finally got to see the Picasso exhibit at SFMOMA which is leaving on 5/28. What was wonderful about this exihibit, besides seeing all of the work by Picasso, is that it explores the effect that Picasso had on 20th Century art. This was done by showing Picasso’s work alongside the work of Stuart Davis, Willem de Kooning, Arshile Gorky, John Graham, Jasper Johns, Roy Lichtenstein, Jackson Pollock, David Smith, Max Weber, Louise Bourgeois, Lee Krasner, and Joan Mitchell, artists who directly and openly interpreted his style, used the same palette, or used his work as a jumping off point. Interesting piece. I found myself thinking about how technology imitates art in life regarding trying to make television into a 3 D picture, to create a sense of depth, movement and space. We are not happy just to have the picture but want to interact with it as well which he seemed to want to do as well. We want to be so close to our work that we are within it’s confines, both literally and figurtively. It must be something from the muse that drives us to look and see, past what we create in 2D, to constantly bring it to our understanding. It is not enough to understand it on it’s own merit but the need to bring it home to me so to speak.